The Illinois Bicycle Lawyers at Keating Law Offices have settled a case on behalf of a Chicago bicyclist who was struck by a motorist on Milwaukee Avenue on April 6, 2012. At the time of the collision, both the motorist and the bicyclist were traveling southbound on Milwaukee Avenue towards its intersection with Belden Avenue. As both vehicles were traveling southbound, the motorist suddenly attempted to turn right onto Belden Avenue across the bicycle lane where our client was lawfully riding. This "right hook" caused a collision with the client's bicycle and violently threw him to the ground. The bicycle was pinned underneath the car at the scene. The motorist initially got out of her vehicle and apologized to our client. Strangely, she then got back into her vehicle and fled the scene before the responding officer arrived. The Illinois Traffic Crash Report listed the collision as a "hit and run." However, due to the quick thinking of the injured bicyclist he was able to get enough information to later locate the driver. Section 5/11-703 of the Illinois Vehicle Code requires motorists to maintain a safe distance of at least three feet when passing a bicycle. Obviously, the motorist in this instance failed to maintain a safe distance when passing our client, as she collided directly into our client with her vehicle. In addition, the motorist violated several provisions of the Illinois Code when she fled the scene of the collision before the police arrived and left our client injured and lying on the ground. Our client was transported to the emergency room where he was diagnosed with head and spinal injuries following a physical examination, CT, and x-ray. Our client's bicycle and laptop computer were also damaged in the collision, and he lost wages in the days following the collision when he was physically unable to return to work. Following negotiations with the driver's insurance company, the Illinois Bicycle Lawyers of Keating Law Offices reached a favorable settlement on our client's behalf. Keating Law Offices is the premiere law firm representing victims of bicycle collisions in Illinois. The firm has successfully represented numerous Illinois bicyclists throughout Chicagoland and the rest of Illinois who have been injured in a bicycle accident or bicycle crash while riding. Attorney Michael Keating is the Chair of the Bicycle Litigation Committee for the national trial lawyer's association. 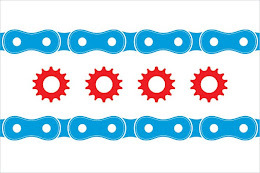 If you have any questions regarding this post or an issue involving a bicycle accident or Illinois personal injury law, please contact Illinois Bicycle Attorney Mike Keating at 312-208-7702 or MKeating@KeatingLegal.com 24 hours a day, 7 days a week.